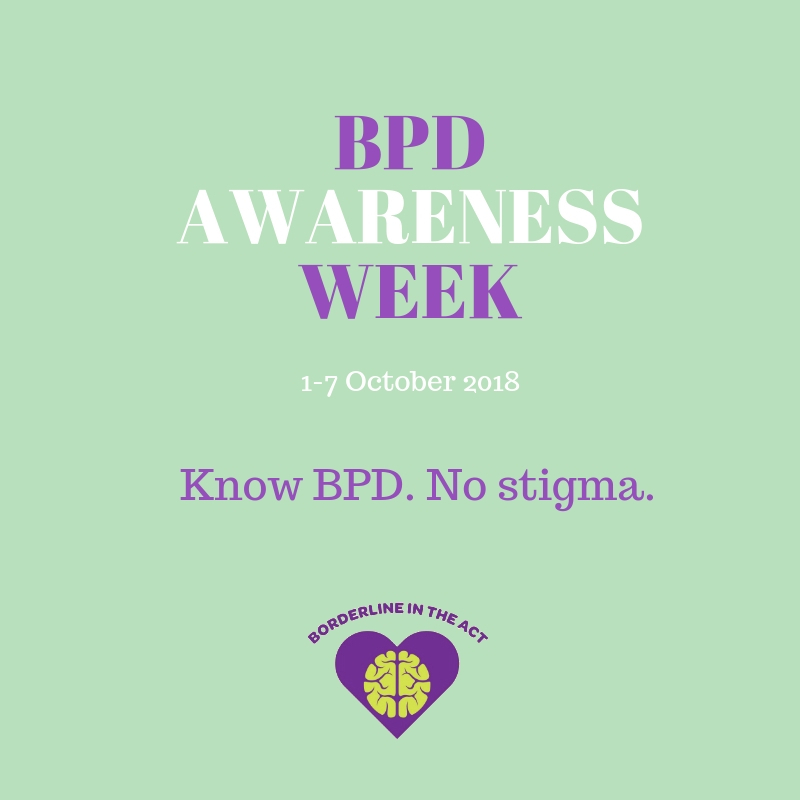 You are here: Home / BPD Awareness Week 2018 / Know mental health. No stigma. It’s time to smash taboo and talk about BPD. Borderline personality disorder is one of the most stigmatising mental disorder – not only among the public, but also among mental health professionals. But with the theme for this year’s BPD Awareness Week is “Know BPD. No Stigma.”, we’re being encouraged to bust some myths and get to know the facts about BPD. Why bring attention to BPD? BPD is a serious mental health disorder that can be highly distressing for the person affected as well as the people around them. It is estimated to affect 1-4% of the population of which three-quarters are women. Of the BPD population, 10% die by suicide. BPD is characterised by poor self-image, fear of abandonment, suicidal thoughts, impulsive behaviour, and dramatic mood swings, so people living with the disorder usually have unstable, interpersonal relationships and may have trouble keeping a steady job. But this is all very treatable! The term ‘borderline’ originated 80 years ago to describe people in between psychosis and neurosis when neuroses were believed to be treatable whereas psychoses were not. Those who were ‘borderline’ carried a surplus of stigmatising labels in addition to living with a mental illness, such as ‘treatment-resistant’, ‘manipulative’, ‘attention-seeking’ and ‘irrational’. Today, neurosis is no longer a relevant mental health term and BPD is not a psychotic disorder, yet the public and many service workers still associate BPD with such negative stereotypes and continue to demonise and reject people with BPD. In fact, due to this historical stigma, as well as the classification of personality disorder seems outdated, many of today’s experts are debating to rename BPD as it is closer to a mood or identity disorder. Suggestions have included complex posttraumatic stress disorder and emotional intensity disorder. The stigma in the name is one of the reasons why receiving an accurate diagnosis for BPD isn’t always easy. Misdiagnosis often occurs leaving individuals seeking inappropriate (and sometimes risky) treatment by medication. An early diagnosis means timely access to early intervention by psychotherapy. Myth #1: BPD is ‘treatment-resistant’. BPD is highly treatable! BPD-specific treatment such as Dialectical Behavioural Therapy (DBT) is locally available in the ACT at ACT Counselling and DBT Canberra. DBT focuses on mindfulness and teaches individuals to control intense emotions, reduce self-destructive behaviours, manage distress, and have meaningful relationships. Studies have shown that nearly 85% of people with BPD experienced remission over a period of 10 years and of those, only 12% relapsed. Medication is not the main treatment as evidence has shown that medicines only provide minimal relief of BPD symptoms and does not improve other aspects of the illness. Myth #2: People with BPD are ‘manipulative’. Although some behaviours presented by people with BPD may seem ‘manipulative’, their behaviours are not intentionally manipulative. Their actions are often an attempt to avoid confrontation, abandonment, and/or to seek validation. Myth #3: People with BPD are ‘attention-seeking’ and ‘irrational’. People with BPD are highly sensitive individuals described by leading researcher on BPD, Marsha Linehan, as emotional “third-degree-burn patients”. Treatments such as DBT would help individuals with BPD to cope with their strong emotional distress and navigate situations and relationships in more appropriate ways that come more naturally to others. For more myths and facts check out borderlineintheACT.org.au ‘Myths and Facts’ page. Call Lifelineon 13 11 14. Visit Borderline in the ACT. Call beyondblueon 1300 22 4636. Visit Australian DBT Institute online. Visit SBS Health Explainer: Emotional Turbulence BPD. https://www.borderlineintheact.org.au/wp-content/uploads/2018/09/BPD-awareness-week.jpg 800 800 Sandra Wiens http://www.borderlineintheact.org.au/wp-content/uploads/2017/08/logo-transparent.png Sandra Wiens2018-10-01 06:42:062018-09-26 15:30:48Know mental health. No stigma.